I've actually worn something really similar on the blog before (I can't even link to it because the pictures are embarrassing - think posing in front of a weedy flower bed and really moody picture editing). But, I'm a normal person who wears stuff more than once. Actually, I'm trying to wear my "regular" clothes as much as possible before my belly splits the seams of all of my bottoms, which is pretty close to happening. I wish I could pretend that I haven't split the seams of some of my underwear already, but then I would be lying. I did not expect to laugh as hard at the underwear thing as I did. Thanks for that. Also, I really love the pattern and colors of this skirt. So cheery and refreshing. And the necklace totally pulls the whole look together. You dress that bump beautifully! Haha! You are so funny! The chambray top looks perfect with the yellow floral skirt! You look great! Oh split seams! I know you want to wear your normal clothes as long as possible, but make your pregnant self comfortable! Love the necklace! aw you look so cute! i split a pair of jeans once, i was like 16 and had just gotten a job at mcdonalds. not fun at all. Awww your bump is just adorable! This outfit is gorgeous! Love the skirt! Its really pretty! 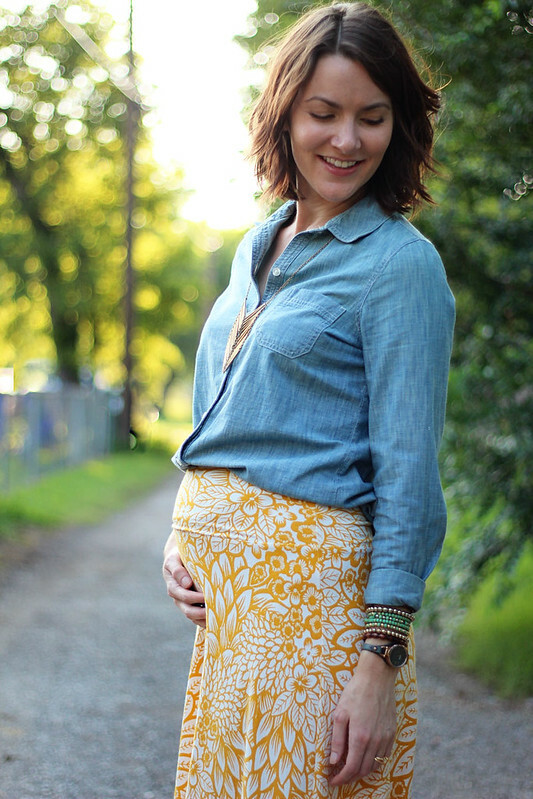 I love how you are styling your adorable baby bump! Congrats! 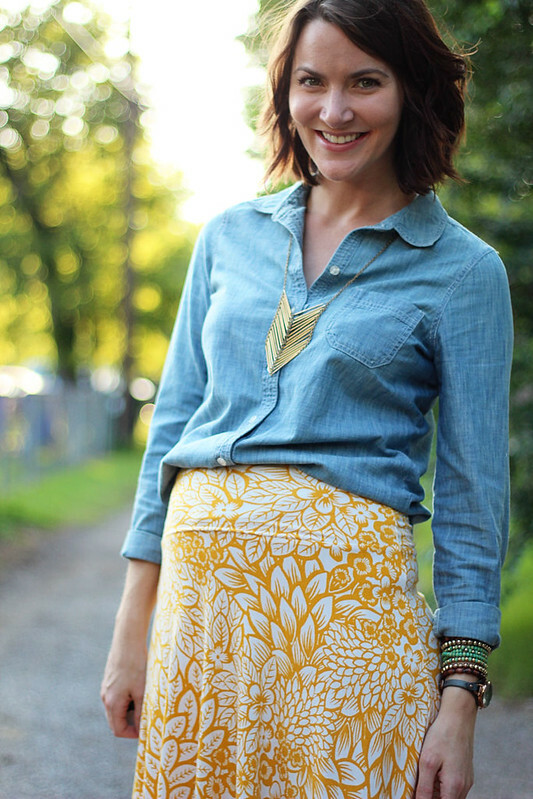 The chambray really brings out the yellow in the skirt! Loving this look on you! There's that bump! This skirt really shows it off, I hope you get some more time with your regular clothes! Your bump looks adorable in this outfit!! I really like this whole outfit, but the skirt especially! haha, keeping it real! I appreciate that! You look so pretty here. I think this outfit is the perfect combination for the end of summer. you look adorable with a baby belly! also, I've decided I'm going to have to get my hands on a chambray top...where do you recommend?? It seems like I've seen around $40 which isn't awful but I don't know that I want to spend that much. So adorable! I love your bump. And the stretchy skirt is perfect! love how the gold necklace plays off the yellow skirt and ties everything together. LOVE this! Your skirt is perfect with your chambray and gorgeous necklace! So cute!!! It's getting harder and harder to dress my bump so I love this inspiration! Your bump is adorable! I really like this outfit. The blue and yellow go so well together and I love your necklace! I may have laugh so hard and loud that my husband gave me a dirty look. You are adorable! I think I just snorted while reading this. You look amazing! Haha, your confession cracked me up! :) You look lovely and your sweet little bump is just precious in that beautiful skirt!! AWWW!! look at that adorable little bump! You look GOOD girl! aww, you look so cute with your baby bump! love the mix of chambray and yellow! one of my favorite combo! I love this! Your little bump is getting bigger and it's so fun to watch your progress! That skirt looks super comfy. Haha! I can't believe that happened to you especially since your bump is so tiny! I love that skirt on you. It's so cute! This is my favorite outfit! 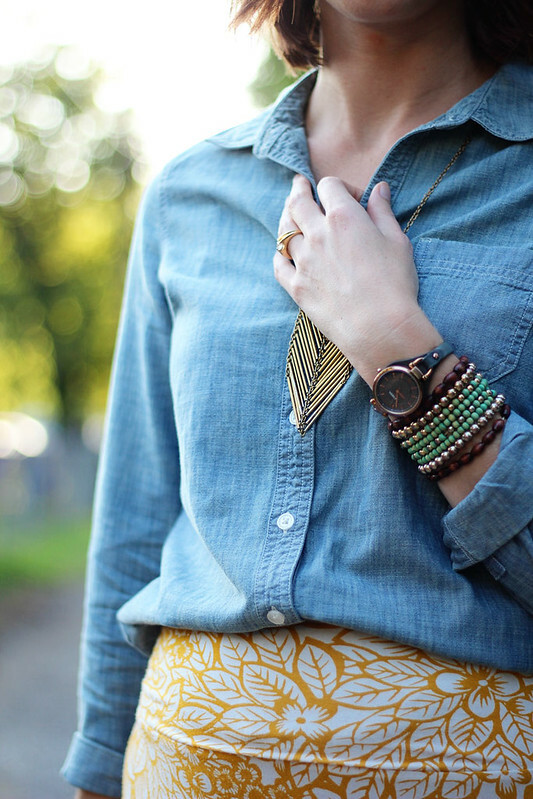 I love the chambray paired with the yellow pattern. And that necklace is so good! You are so adorable pregnant. I love seeing your progress. Such a cuteeeee bump! I disappear for two weeks and then there's this bump. Oh how I love all the blogger bellies! They are adorable.